After writing about Leonora Carrington today, I was perusing Youtube and came across this clip from a documentary about her life, which also includes a filmed rendition of her short story, “The Debutante,” which is both humorous and grotesque, as you’ll see if you watch the clip. It’s about ten minutes in length, and my favorite part is toward the end when Carrington, while being interviewed, says, “My anger is that I was put on the market,” in reference to the compulsory selling of upper class daughters into marriage during her youth. In a world where women are still being bought and sold and controlled, I think the voice of an old crone (I mean this positively) like Carrington still resonates. 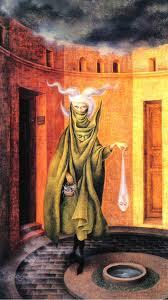 After I was finished discovering Remedios Varo’s life and life work, I returned to the artist who had introduced me to her: Leonora Carrington. What had started out as a seeming fluke was becoming something slightly bigger to me. A friend of mine, Maureen McHugh, who is also one of my former writing teachers, once told me that writers write about their obsessions, when they’re doing it right. The things that consume them. And these artists and their work had begun to seem a bit like an obsession to me. The worlds they created resonated with me, and I wanted to find a way to live inside those worlds for a longer period of time than I could simply by looking at their paintings. So writing stories became the way I could engage with them more fully. But it was also through the research into their own lives that I began to see a pattern emerging. 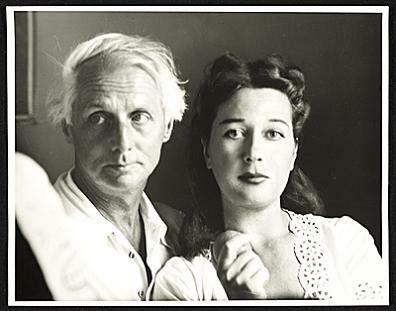 A pattern where women artists were excluded from surrealist art circles, except as romantic attachments. But even then, attached as a girlfriend or wife, they weren’t seen as equals, regardless of the superior work they were producing. They were seen as hobbyists. In the painting, a giantess with a cherubic face shrouded in golden wheat stands within the confines of a rustic village with the ocean tumbling behind her, Viking boats riding the waves. She appears to have just arrived on the scene, and within the cup of her comparatively small hands she holds an egg. Below her, villagers have arrived to combat her with pitchforks and guns. She’s clearly seen as a threat to their way of life, though she bears life itself—the egg that she holds—as its guardian spirit. This was the image that I wanted to work with from Carrington’s prolific collection of paintings. And unlike Varo, I didn’t get a sense of continuity in terms of “world story” from Carrington’s work, so this was the lone painting that I intended to work with. It set me up for quite a different process in story-making. Unlike Varo’s work, where individual paintings provided me with protagonist, antagonist, setting, sub-character, etc, I would need to draw all of my story resources from one painting alone. It made me think about my approach differently. I needed to think of the painting as a question. What’s occurring here? What does this scene depict? 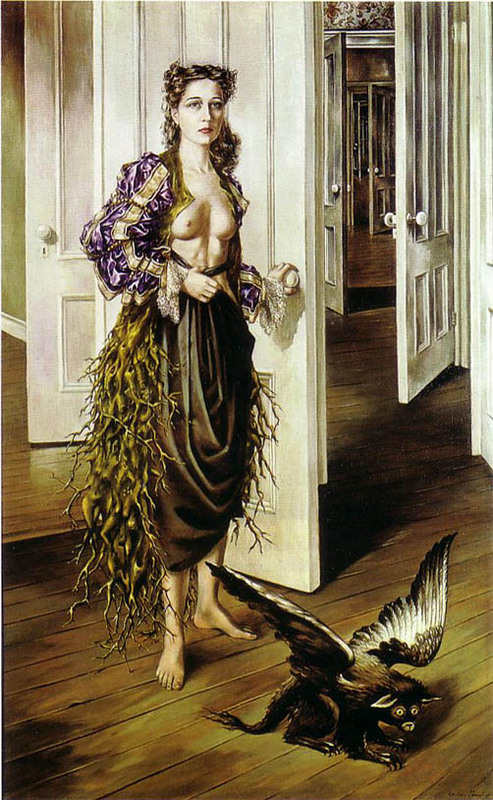 The painting demonstrates the wealth of metaphoric imagery that Carrington used to explore her own strict and restrictive upbringing in an upper class industrialist’s household, where her father did whatever he could to obstruct her path to becoming an artist, which Carrington would always see as an obstruction particular to her being a woman who wanted to pursue a career that would lead her away from the manners and mores of her family’s way of life. But the painting also represents a broader concern with the generally small-minded, old-fashioned, rustic “villager” mindset, which holds fast to traditional roles for men and women. The appearance of the giantess on their shores is a perceived threat to their lifestyle, which has surely prepared them more to expect the appearance of a god rather than a goddess. But there she is, unable to be ignored, larger than life, right in front of them. In every single way, this painting felt like a metaphoric icon for Carrington’s own battle as a female artist within a culture that would confine her to pre-approved and pre-arranged social roles. But she was too big for that. Way too big. If you look into her back story, she was quite the heroine of her own life. She ran away from home to join the surrealist circles in Paris at a young age, took up with Max Ernst, was listed as a dissident by the Nazis and fled Paris to Spain, where she was virtually imprisoned in a psychiatric hospital by her parents and treated with drugs that were later banned by authorities. A few years after her release from the hospital, she wrote down the experiences in a small book called Down Below. Knowing a bit about Carrington’s life and how she reworked her autobiography into visual metaphors of magic, I decided to explore the arc of her story–a young woman who grows larger than life, larger than the roles that are available to her in her constrictive community–as a modern tale. So instead of rustic villagers meeting the goddess with their pitchforks and guns as she comes ashore, I wrote a story about a seventeen year old girl who is confronted by the many small minds of her suburban American community as she begins to grow into a Giantess and eventually reveals a secret to her brother, the narrator, about her true purpose in life. I linked to that story in a previous blog post, but I’ll do so again here, in case you’d like to read one of the stories for free: “The Guardian of the Egg”. If you like it, I hope you’ll get the book and enjoy the other two stories, and the essay at the end. 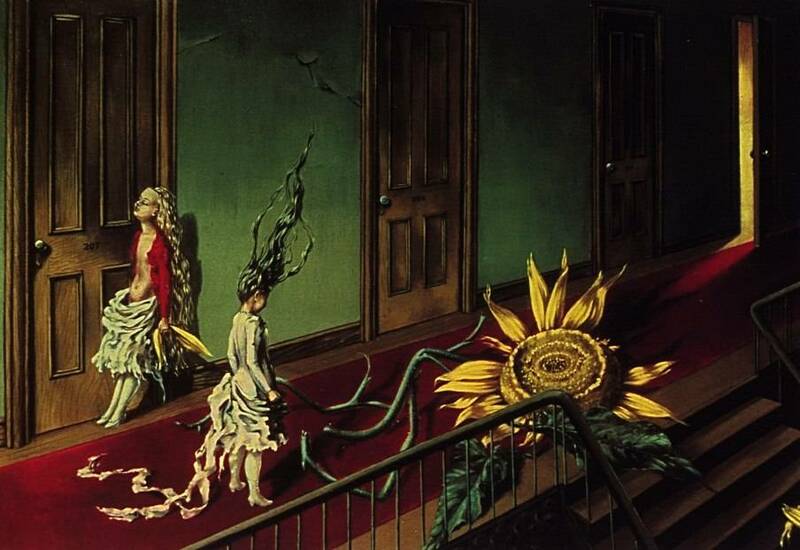 In the near future, I’ll be posting about the third artist in this triptych: Dorothea Tanning. 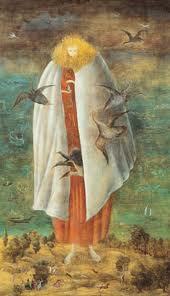 And it was after I saw this painting that I quickly forgot about my research on Leonora Carrington. For a while at least. I had never seen surrealist art that looked like this before: so precise, as if the artist was not so interested in tearing apart reality, but creating a new reality instead. 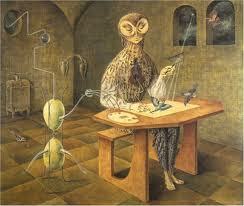 Modernist surrealism was more about distortion and alienating effects. It walked the line of grotesquery, transfiguring reality and the received notions of reality we all have into a strange, often uncomfortable scenes of breakdown. I’m thinking of Dali at the moment, and his famous melting clocks in a desert landscape, for instance. An arid world where time no longer matters. That, in a way, was really typical of surrealist art at the time. But Varo, who was making art at the same time, didn’t seem interested in the breakdown of concepts like time or landscape or the human body. She seemed interested more in the creation of new notions of time, landscape, and in the invention of character and narrative in her paintings. I was immediately hooked by her, and my research on Carrington went to the side temporarily, so I could seek out more and more of Varo’s work. As mentioned, I was working on a Master’s degree at the time, and was in my second semester, taking a poetry workshop with the poet William Greenway, who had focused his workshop on the process of ekphrasis: the writing of poetry in response to paintings or visual art. I spent a lot of time that semester looking at paintings and writing (mediocre) poems in response. But I was really invested in the process I was learning. I was excited, even if my poems wouldn’t have seemed exciting to anyone who read them. I’m not a poet, and while I appreciate and love poetry, I always feel like I’ve been strait-jacketed whenever I’ve tried to write a poem. I’m more inclined to prose and narrative, and so, when it came to the final project for the class, I asked Will Greenway if I could write a short story in response to the visuals of Remedios Varo, rather than doing a series of poems. Will gave me permission, and it was then that I started to put together a story in a very different way than I ever had prior to that course. Because Varo’s work is so character and place based, with inferred narratives clearly occurring within each painting, I felt like I could easily access those stories. I’d been looking at her paintings for several months by that point, and several revealed themselves to me as somehow being connected (though, really, all of Varo’s paintings feel connected to me, as if they are simply windows onto different personages and places in the fabulist landscape she created). The first was “Creation of the Birds,” pictured above. In the first painting, it was clear to me that the Owl or Bird Woman of the painting was using celestial light to create, whereas in this one, the Star Catcher was imprisoning and collecting celestial bodies. They seemed to me like the perfect oppositional personages. They would be my protagonist and antagonist, respectively. This is a small image, so I’m not sure how easily viewable it will be on-screen, but essentially it presented me with my setting. And because I’m often inspired by setting as more than just the background wallpaper of a story, but as a thematic or sometimes conflict-driven aspect of narrative, I was attracted to “Spiral Landscape” as a potential embodiment of the conflict of cyclically toxic relationships, which the story presents. Opposites like the Bird Woman and The Star Catcher do attract from time to time, and they tend to have explosive relationships and histories that are hard to escape. The setting for these two characters would itself become part of their conflict. (I also just thought it would be pretty cool to live on a spiral shaped island). I loved the idea of leaving a psychoanalyst with his head (head shrinking), his thoughts, his interpretations of your problems, rather than your own. In the painting, the woman’s hair is completely twisted, and she’s about to drop the psychoanalyst’s head (as I interpret it) into a well. Good riddance. I didn’t utilize this painting in a direct equation in my story, though. I placed the Bird Woman instead in this position, and created a third character, the Psychoanalyst, who she seeks help from to resolve her relationship issues with the Star Catcher. He serves to be a bit of a comic character in my story, and a good “extra” that allowed me to get outside of the Bird Woman’s interior space every now and then, as he literally becomes a “talking head” in my story. I’d never conceived of a story in this way before, and it was really one of the most fascinating processes I’d ever gone through at that time in my experience as a writer. I’d been used to writing from within my own interior/emotional imaginative landscape. This process compelled me to absorb someone else’s world, to inhabit it, to figure out how it might “play” in a prose narrative. I still needed to invent, but I had to work with materials borrowed from a visual artist. A picture is worth a thousand words, they say, and I discovered that was pretty much true, though sometimes a picture can take more than a thousand words. The story I made, “The Creation of Birds” (just a bit different from Varo’s original title), was a bit over six thousand words in length, made from these four paintings filtered through my imagination. 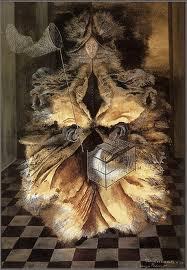 Note: I’ll be back in a couple of days to talk about Leonora Carrington, who I returned to after my research into Varo. Birds and Birthdays has officially released into the wild. It’s been available directly from the publisher for the past couple of weeks, but will be appearing in other marketplaces now, like Amazon.com (where they say it’ll take 1 to 3 weeks to get the book, but that’s only because they’ve just recently placed orders for stock with the publisher themselves). Surprisingly and already, the book has received its first review yesterday as well! It’s over at Tor.com, and it’s a good one. So if you can’t take my (very biased) word that the book is good, take this reviewer’s. I’m excited to have this book made real. For a long time, I’d thought it would be very unlikely to find a publisher for it, even a small indie press, who might be interested in a collection of three short stories and one essay, centered around the surrealist art of three women from the early half of the 20th century. But while that was a realistic doubt, it proved not to be true. For the next few weeks, I’m going to be occasionally blogging here and in some other places about the book, its conception, the process I went through in researching and writing of each of the stories, the artists whose paintings inspired these stories, and how I went about organizing the book itself. It’s a small book, just a little over 100 pages, which seems as small as a grain of sand in a world where hugely huge epic page-turners pound the pavement around it. But I’ve always been fond of small things, the contained and hermetically sealed worlds of snow globes and dioramas, and I know there are folks out there who like things like this too. So I’m hopeful this small book might reach their attention, despite the clamor and bustle of the giants lumbering around it. If you’re interested in reviewing the book, contact me by email and I’ll see about getting a copy into your hands. And if you read and enjoy the book, and feel so inclined, please help me tell other people about its existence. Share links to it on your social networks, review it on Amazon or Goodreads or other places. I appreciate any help my readers can lend me. In a day or two, I’ll begin posting about the topics I mentioned above, but for now, if you want a sneak peak at one of the stories in the book, you can read the second story, “The Guardian of the Egg,” for free at The Journal of Mythic Arts, where it was reprinted several years ago. 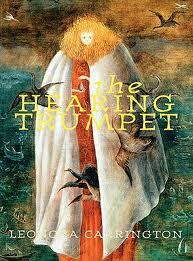 That story was written in response to a painting of the same name by the artist Leonora Carrington. And be prepared for a giveaway soon, too. Happy birthday, Birds and Birthdays. Just a quick note to let everyone know that my new book, Birds and Birthdays, is available at the moment directly from the publisher, Aqueduct Press. The book will be available via other outlets in the near future, and will also be available as an e-book, but if you’re looking to get a hold of the physical copy now, you can procure it by way of this link to the book’s page on the publisher’s website. I’ll be back around when the book is out in full force and making the rounds. If you’re a reviewer interested in reading the book for review on your website or blog, please feel free to contact me by e-mail (christopherbarzak AT gmail . com). I only have limited copies, though, so requests from reviewers with larger readerships will have to take precedence. Thanks so much! More soon!